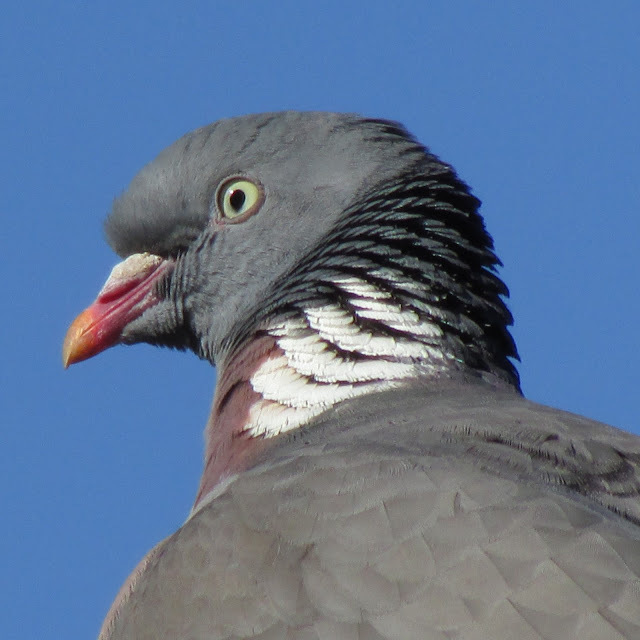 Although the woodpigeon is the bird I come across most often and the one I record the most, it is still one of my favourite birds, the species that made me a birdwatcher. I find them truly stunning and very resourceful, feeling at ease in gardens, parks and woodland alike. Despite their reputation as grain guzzlers their diet includes leaves, nuts (acorns and beech mast), buds, flowers and berries, including rowan, ivy, holly, cotoneaster and alder, which they often reach with great acrobatics. Although Woodpigeons have featured often in this blog, here I am compiling and documenting their calls and displays, especially those related to reproductive behaviour. 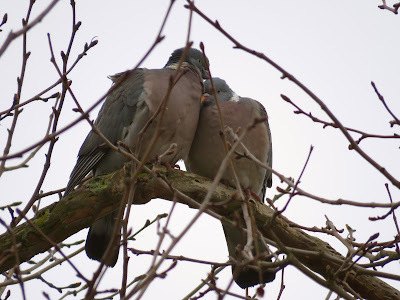 Although in his article on woodpigeon behaviour Cramp says that 'they mark their ownership of a territory primarily by just being there' as indeed 'a Woodpigeon perched in a tree bare of leaves is a large and conspicuous object' Woodpigeons have a simple, but interesting behavioural repertoire. Advertisement call. A deep, repeated 5 note phrase that serves as a territorial song. This is the well know Woodpigeon song, often heard early in the morning. Display flight. This is another territorial display most frequent in February and March. The male flies around the territory rising in a broad arc, and then gliding down with wings held stiffly horizontal advertising ownership. They can do the rising and falling a few times before alighting. Although mainly a visual advertising display, as the bird does not call, sometimes the bird will make a clapping noise with its wings at the apex of the arc. The Bow display. It is a courtship display that territorial males perform when still unpaired and trying to attract a mate and also when the pair bond is becoming cemented. The male approaches the female and with his neck enlarged he calls a three note call as he alternatively stretches up and then lowers its head, displaying the white and iridescent neck markings, and fanning the tail when it's at its highest. Check out this wonderful photo by Richard Hawley showing the display when fanning is at its maximum. Females can display some aggressiveness to the courting male, move away or flee if they are not interested. This display often happens on trees, roofs or aerials, but occasionally on the ground. 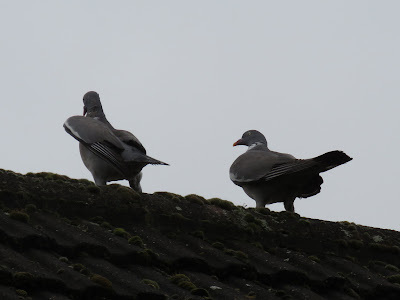 When on the ground the male will try and get closer and follow the female hopping to bow just in front of her, one of the few occasions that woodpigeons will hop instead of walking. Allopreening, billing and mating. Feeding the mate, gentle preening and billing precedes mating. I documented this behaviour in a series of photos here. Slightly opened wings is a threat posture. Fighting. Woodpigeons have large chest muscles, which power their explosive take off and fast flight. They have small bills and legs, so they also use their wings as offensive weapons in their territorial fights. Males will fly towards intruders landing in their territory and land adopting an aggressive stance, with neck stretched, flattened plumage and semi-open wings, and often this is enough to drive the intruder away. Occasionally, this develops into a fight, which sometimes occur in the depths of a tree. 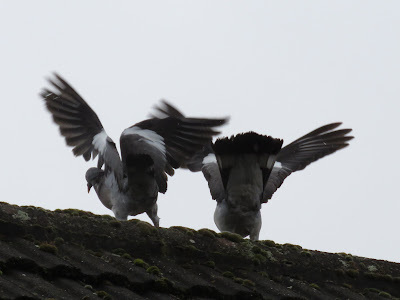 The pigeons will land near each other, alight their bodies and flap trying to hit each other (above). Cramp, S. Territorial and other Behaviour of the Woodpigeon. Bird Study 5, 55–66 (1958). here. Thank you for a fascinating and highly informative post.